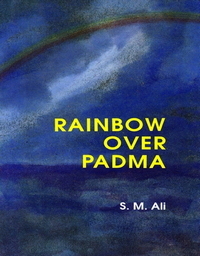 Rainbow over Padma is a novel of hope and is published posthumously. It is the picture of Bangladesh the writer would have liked to see reborn out of its present suffering. The real heroes of this novel are the people of Bangladesh. Set against the grain economic and political situation in Bangladesh in the late eighties, the novel depicts the struggle of a group of people to create a new future for their country. Under the guidance of a Bangladeshi writer who returned home after living abroad for nearly a quarter of a century, they set up a broad-based movement that draws its support from the villages. They seek to promote grassroots rural development, brings hope to poverty stricken farmers and landless laborers. This eventually produces a new kind of community leaders who seem capable of challenging the rotting socio-political order in the country and the administration of President Abul Morshed. The novel makes a case for the kind of development that can save a country like Bangladesh. Amongst many example that the author depicts is the case of a small poverty-stricken village which, for years, has been living below subsistence level turns to apiculture and discovers a new source of income. At a small town in southern Bangladesh, two hundred rickshaw-pullers set up their own co-operative society and eventually own the vehicles which they once used to hire on daily basis. It describes a development that touches the lives of teeming millions.